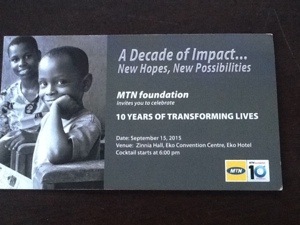 MTN Foundation, the Corporate Social Responsibility arm of the telecom provider, hosted dignitaries and “proletariat like himself”, as the Chairman of the foundation, Prince Julius Adelusi-Adeluyi (OFR)’ described the audience, to a Networking/Exhibition event to mark its 10 years of operation. Tagged 10 Years of Transforming Lives, A Decade of Impact … New Hopes, New Possibilities, the event saw emotions welled up as the guests were treated to a heart-rending and heart-warming documentary highlighting its charitable interventions in the lives of numerous individuals in the areas of education, health and economic empowerment. Nonny Ugboma, Executive Secretary of the foundation, warmly welcomed the guests to the programme. In his Chairman’s remarks, Prince Adelusi-Adeluyi went down memory lane, regaling the guests about the methodical birthing of the foundation in the year 2005 and its steady growth over the years. He also got the audience to honour the memory of two members of the Board of Directors who had passed on. A comprehensive documentary was then featured on the growth and the activities of the foundation over the years, parading an array of its beneficiaries, most notable among whom was a teenage boy, Great Nkpor, who was a serious burnt victim as a toddler. But for the lifeline offered to him by the foundation, as confirmed by his parents in the moving narrative they rendered, his life would have been a total wreck or even stunted. Following the documentary, a Perception Audit was then presented by a polling firm, indicating a relatively low awareness level by the general public regarding the existence and the activities of the foundation. The Keynote Speaker at the event, Babatunde Raji Fashola (SAN), the immediate past governor of Lagos State, aka Governor of Example, triggered a lively debate among an array of erudite panelists and members of the audience with his thought-provoking address on Corporate Social Responsibility and the society.